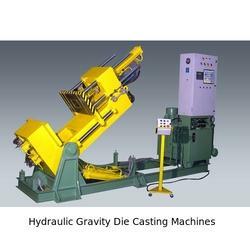 Automatic Gravity die casting machine With very easy to use functionality. Every movement is programmable thorugh LCD display. gravity angle is programmable between 0 to 80 degree. Cool time can be set in milli seconds. Our products price range is within Rs. 6.5 Lakhs Rs.8.6 lakhs. Due to our proficiency, we are involved in providing the first-class series of Vertical Gravity Die Casting Machine. Prior to dispatch, presented product is tested against diverse parameters. Stationary GDC Machine are manufactured using quality raw material and sophisticated technology to ensure high performance and longer service life. These machines are capable of producing single concrete block in different dimensions and sizes. We are successfully engaged in manufacturing a wide gamut of Gravity Die Casting Machine. Enriched by our vast industrial experience in this business, we are involved in offering an enormous quality range of Gravity Die Casting Machine. • die mounting area - 970 mm (b e t w ee n columns) x 1200 mm or 1200 mm round. • max. & min. Daylight - 1050 mm & 350 mm. • main die locking cylinder additional core pull/ejector cylinder. 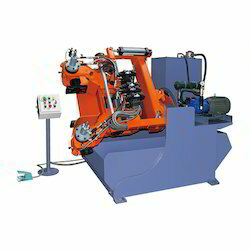 • 90° hydraulic tilting arrangement with infinitely variable multiple speed control.